My friend Bea Rautenberg is a mixed media photographer living in Munich, Germany. Her lovely photos give us a peek at her German Christmastime celebrations. If you are in Munich, be sure to visit her collective handmade store SiebenMachen. Enjoy! 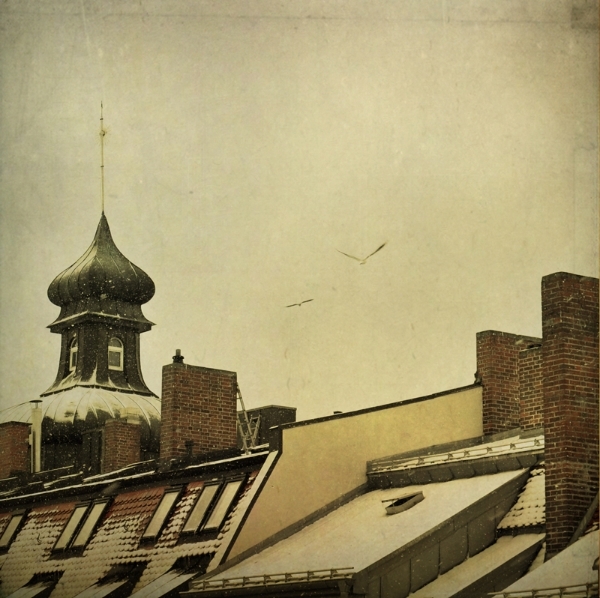 It's snowing in Munich while I'm writing about December and the holidays... I like the way snow transforms a city and gives it some magic. It's so calm and beautiful to take a walk in the snow and to find beautiful things like that apple which fell from a tree (where still some red apples were hanging). Every colour is so much more vibrant against the white colour of the snow. But of course with all that cold it's so nice to get home and have some hot tea together with some (partly) homemade "Plätzchen" (the German word for Christmas cookies). And of course we sing a lot of traditional Christmas songs in front of the tree and the old French crèche (my mother is from France) and then we finally have a delicious dinner together! I wish you all a very peaceful Christmas time! Greetings from Germany and thank you very much, dear Stephanie! Thank you Bea! Your photos are wonderful and just perfect for a atmospheric Advent weekend :) You can also see Bea's 2009 Artist Advent Calendar contribution here. Visit Bea's new handmade, collective store SiebenMachen in Munich, connect with Bea on her website, blog, facebook, instagram, and shop.